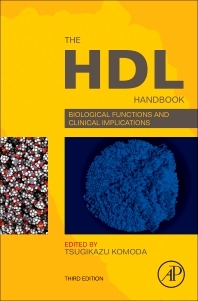 The HDL Handbook: Biological Functions and Clinical Implications, Third Edition, brings laboratory research in HDL from bench to bedside in a reference format for both researchers and clinicians studying cholesterol, lipids, epidemiology, biochemistry, molecular medicine, and pathophysiology of cardiovascular diseases. Information presented is valuable for the development of clinical trials with the aim of improvement of HDL-C levels and the prevention of cardiovascular events. Highlights of this new edition include the science underpinning HDL metabolism including information on HDL-C metabolism, gene expression, gene-bioactive compounds interaction, and post-translational modifications of gene expression of apo-lipoproteins. 3. Relationship Between CETP-Mediated CE Transfer From HDL to ApoB-Containing Lipoproteins and Cardiovascular Diseases: cetp a Pro- or Antiatherogenic Factor? 1. Introduction: The HDL Cholesterol Gordian Knot: Paraoxonase 1 to the Rescue? 5. PON1 Interaction With Myeloperoxidase: A New Link Between Inflammation and Atherosclerosis? 7. CETP Inhibitors Prevent PON1 Activation During HDL Maturation: A Likely Explanation for Their Failure? 8. PON1 in ApoB-Containing Lipoproteins: A Role for PON1 in Small-Dense LDL? 9. Conclusion and Perspectives: PON1 in Clinical Practice? Dr. Komoda is a visiting professor at Toho University School of Medicine in Japan. He has extensive expertise with research in alkaline phosphatase, amylase, and oxidized HDL. He co-operated the intestinal alkaline phosphatase at Washington University School of Medicine in St. Louis, Missouri. He is the recipient of the Kodama Memorial Award from Japanese Society of Electrophoresis.